This year, for the first time, there were two winners of the award: Mary Huntley and Sue Woods. Mary and Sue were nominated for the all the work that they have done, not just in the past year but in the previous ten years, providing the essential refreshments for countless open days and lectures. From fantastic cakes to superb mince pies, including Iron Age dishes along the way, they have been a key part to the success of our public events. As Mary and Sue have always been a fan of Sally Phillips’ wonderful cartoons, the Committee commissioned Sally to produce a cartoon for each of them, which were then framed, and, as usual, they were excellent. 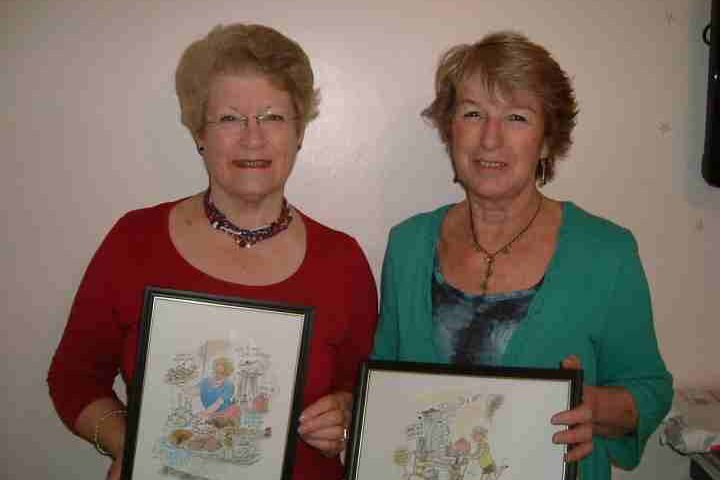 Congratulations to Mary and Sue, who are pictured here with their cartoons.